Enjoy a guided visit to the famous Santiago Bernabéu stadium and Real Madrid museum, visiting the trophy room, field, dressing rooms and more before eating a delicious lunch with pitch views. Enjoy a guided visit with a football lover and expert tour guide to the world famous Santiago Bernabeu Stadium and the Museum of Real Madrid. Classified by UEFA as one of its top tier “Elite Stadiums”, the Santiago Bernabeu holds 81,044 spectators, hundreds of trophies and historic moments in every room and around every corner. 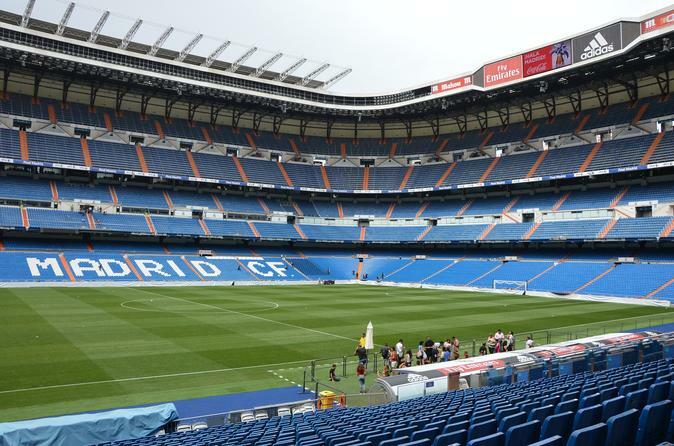 Your stadium tour will include visits to all parts of the ground, including the Real Madrid dressing room, the presidential box, the press room, the photo room, the trophy room and more. You will be able to walk down the tunnel, enter the pitch and touch the grass over which Di Stefano, Zidane and Cristiano Ronaldo have tread and some of the greatest moments in football history have taken place, with great opportunities to take your photo in this unique sports stadium. Following the tour, you will have time to explore the official Real Madrid club shop and pick-up souvenirs of your time. We will then take you to one of the official club restaurants inside the stadium, where you will be able to enjoy a delicious Spanish lunch with beautiful views out over the field.